This is a photo Journal story, written by Peter Kelly, about Key landing out at the gold mines and Barb, Jim and Peter go on a retrieve to bring him home. 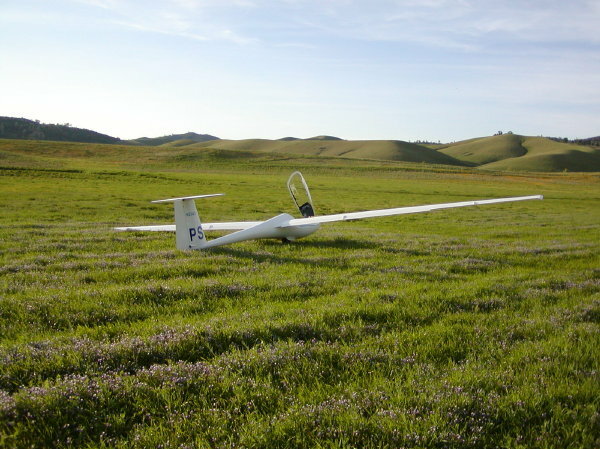 This story was first published in 2004 on our earlier valleysoaring.net web site, but since we fly over this area routinely and the info about fields such as this may be valuable to pilots today. Besides, it’s all a part of our VSA history. I remember this day quite well. Ray-7V was ahead of us as we flew the 100 k task to (3 Sisters – 7M – Rumsey – 3 Sisters). Jim- 1B and Key-PS and I were not far behind Ray, but it was a matter of altitude above the terrain for each of us, as to whether or not we could make it past the gold mines on the way back to WSC. Key was going for speed and had almost caught up to Ray near the gold mines, but that extra speed cost him some critical altitude – and he did the safe thing and landed in a nice field. Those darn VSA Races make people do all sorts of crazy things. Pilots aren’t really competitive, are they? Not Much! Click here to open the event photo album in a new tab. Or, just click on the photo – to see the other seven photos and read the one liners that describe the action.